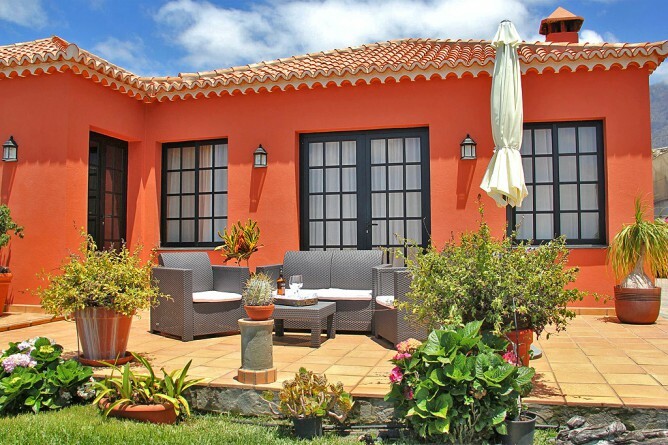 Other: Within a short walking distance from Los Llanos centre. SMOKING ONLY PERMITTED OUTSIDE! 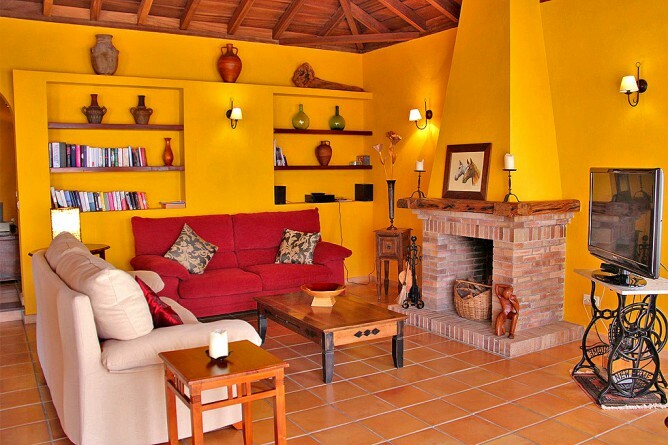 Villa Greca is a modern Holiday House with a pool, lovingly furnished by the Spanish landlords. 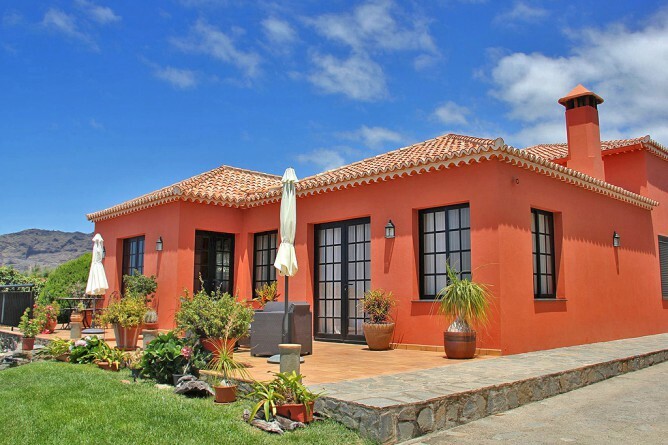 The top quality equipped Holiday Villa is situated on the outskirts of Los Llanos in an excellent climate zone. The property is enclosed and not visible from outside. 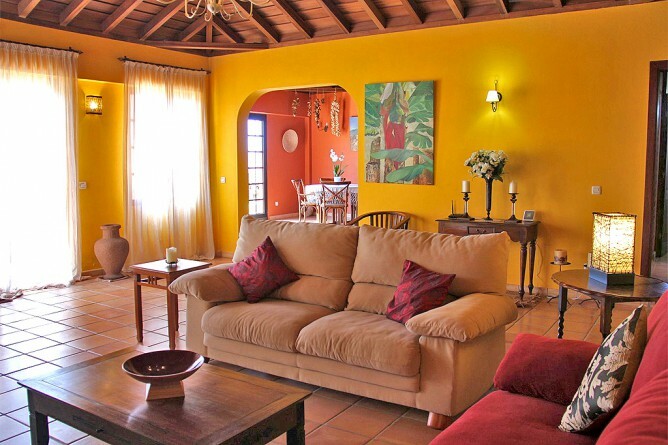 The walls have been designed in order to offer a fantastic view of Los Llanos and down to the sea. 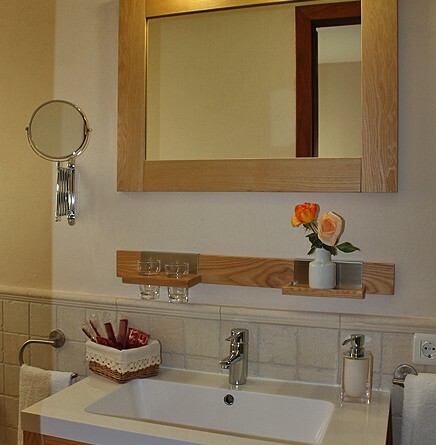 Shopping facilities and restaurants are within a short walking distance. 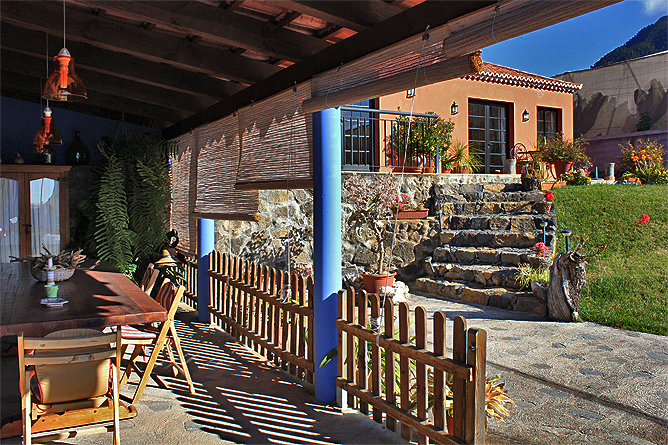 The market hall of Los Llanos is only a short walk from the Holiday Villa. You can buy freshly caught fish as well as vegetable and other local products. 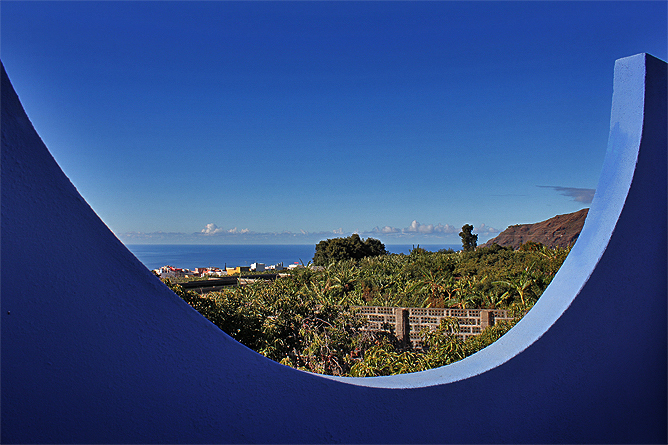 You can also start a hiking tour from the Holiday Villa to La Caldera. The Holiday Villa Greca is situated on a visually enclosed property, walls serve as privacy shields. 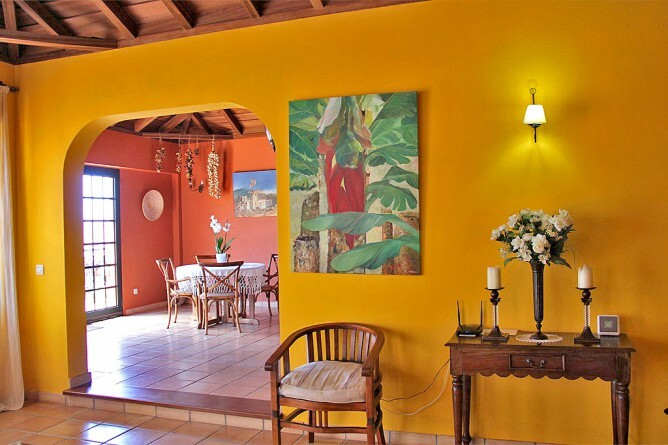 The whole property comprises 4.000m², part of it is used for growing bananas and avocados. The property has two access roads. 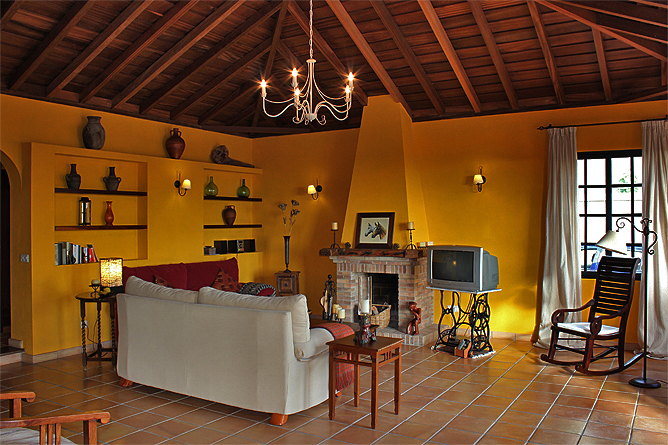 One is only used by the owners, whose house is attached on the back side of Villa Greca. 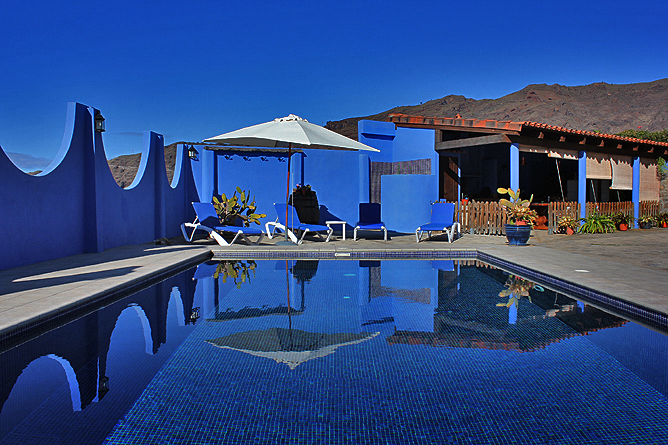 The separate access road for guests on the pool side provides utmost privacy. 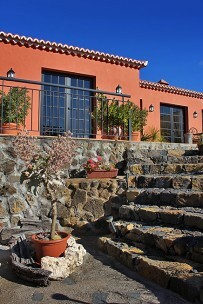 The front side of the Holiday House faces the south, the main entrance is at the side. 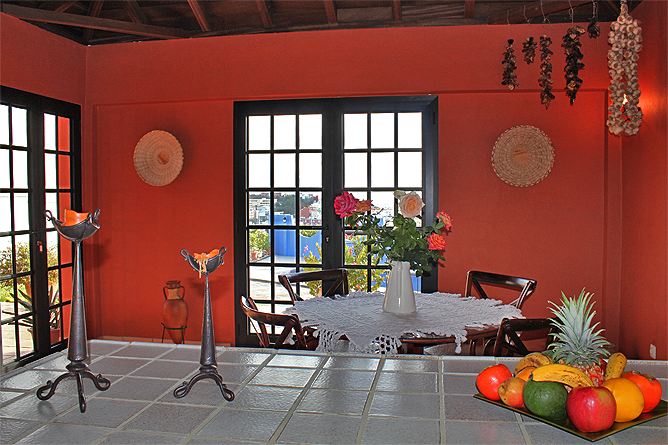 The outdoor area invites to linger and provides a covered kitchen with a grill and a large dining table for six persons. 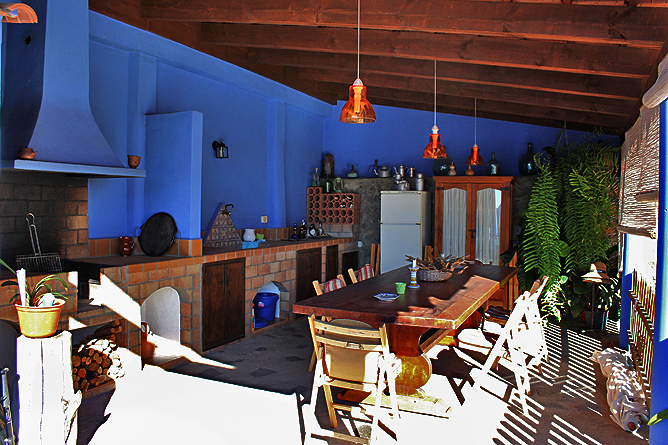 The outdoor kitchen is fully equipped and also features a fridge-freezer. 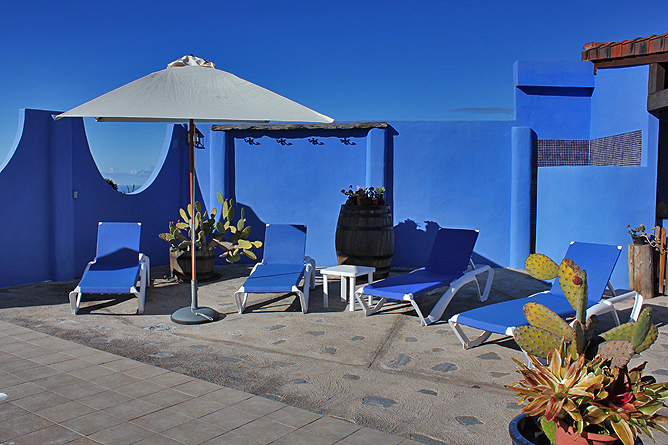 It is the perfect place to enjoy a day at the pool as well as to spend a pleasant evening with a good bottle of a Palmerian wine. 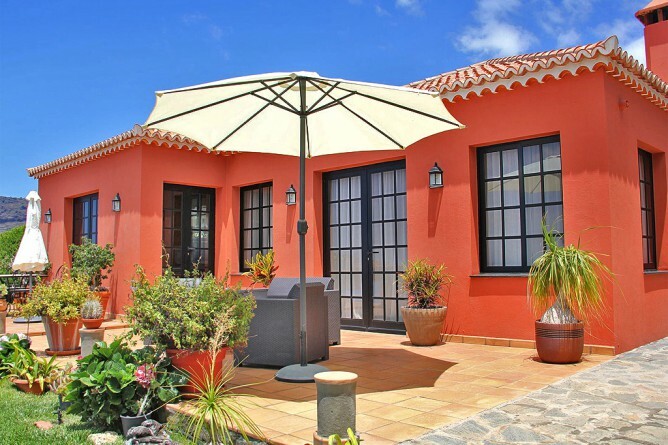 The private pool (8,20 x 4,20m) is sheltered from the wind and the 4 sun loungers as well as a sun umbrella provide every comfort for your sunbath. 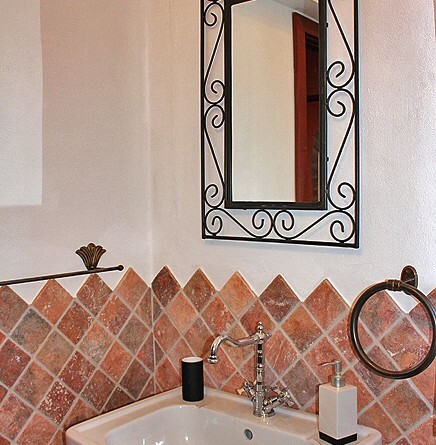 An outdoor shower as well as a toilet are at your disposal. 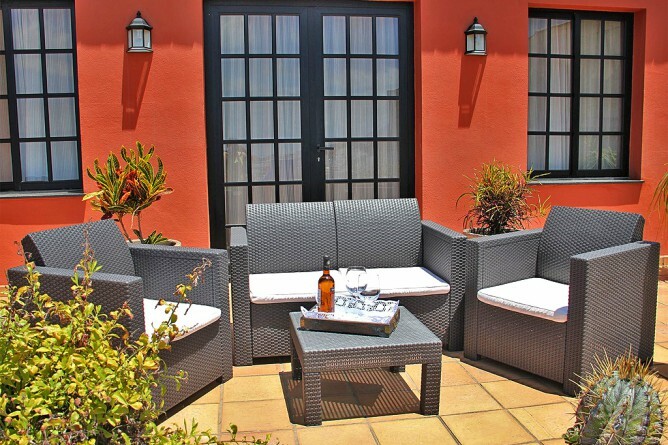 The front terrace is perfect for having a breakfast in the morning sun. 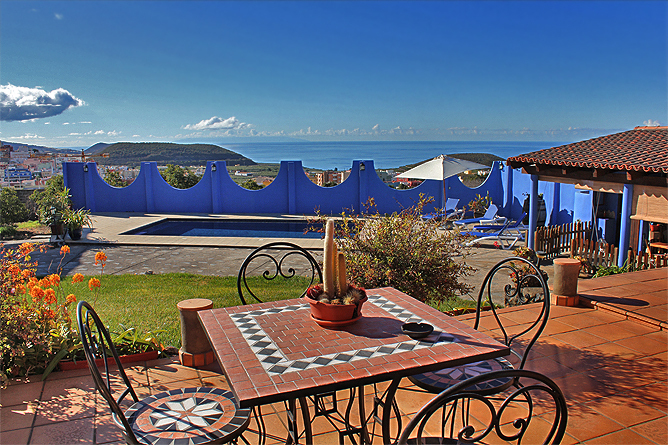 Moreover, it offers a great view of the pool area, Los Llanos, the mountains and the sea. 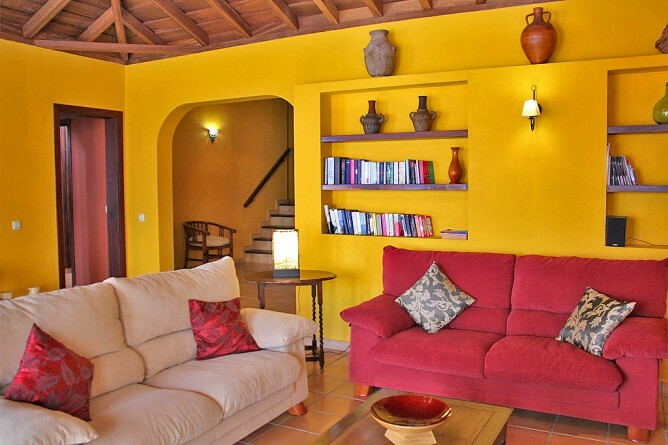 The terrace has an access to the spacious living room with a kitchen and an open dining area. 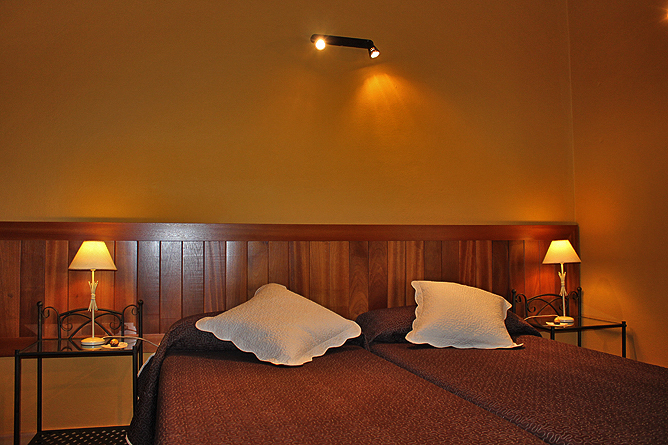 These rooms comprise high Canary wooden ceilings, which create a very cosy ambience. The large sliding glass doors make the rooms light and friendly. The living room has 2 sofas, a satellite TV and a stereo system. There is a WLAN-internet access throughout the entire house. The antique rocking chair invites to enjoy a good book or finish your day at the romantic, open fireplace. A round arch separates the living room from the kitchen and the dining area. 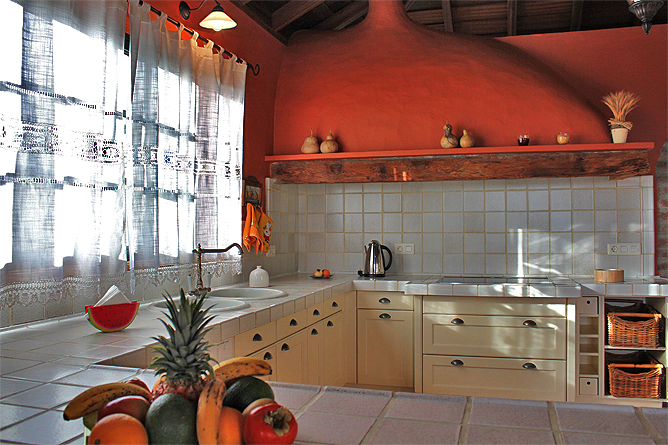 The kitchen is well equipped and offers everything you need to really enjoy cooking. There is a ceramic hob, an oven, a dish washer, a microwave and a separate freezer cabinet for storage. A few stairs offer access to the first bedroom with 2 single beds, featuring elegant, dark colour tones. 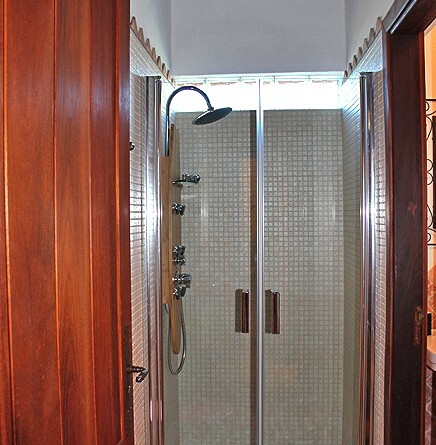 The ensuite bathroom has a hydro massage shower (open at the top) and there is a toilet, located separately. A hair dryer and some more accessories and decoration have been provided for you by the landlady. 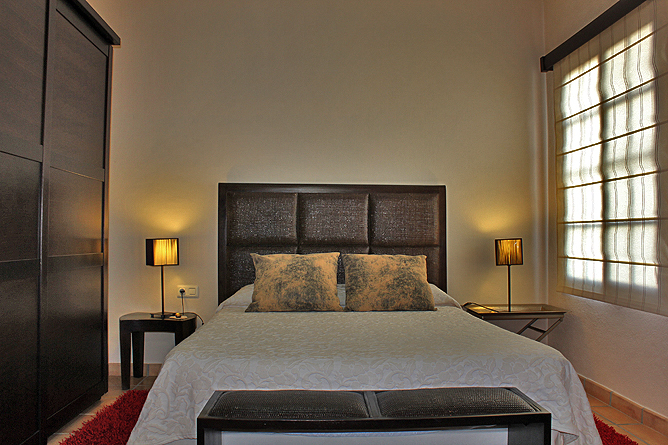 On a slightly elevated position there is the second bedroom with 1 double bed. The owners went for a modern furnishing. 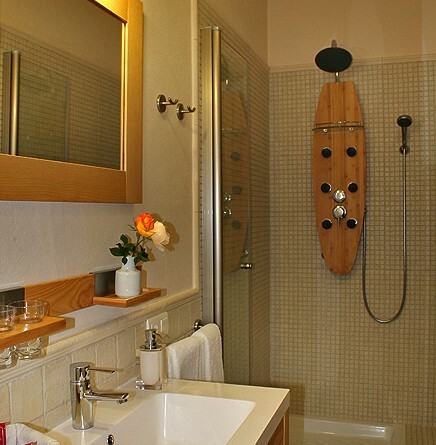 The ensuite bathroom has a toilet, a hydro massage shower and a basin. 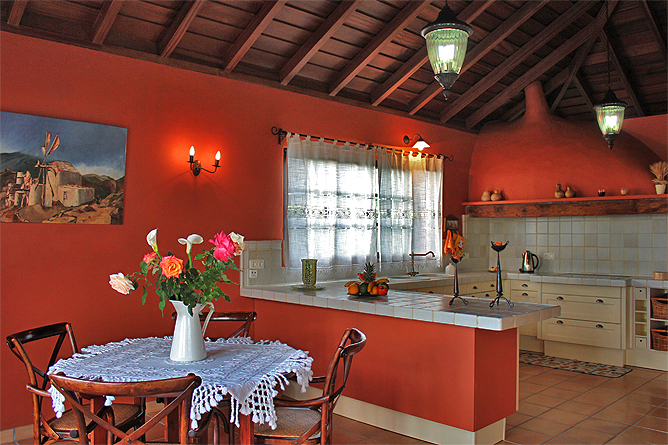 The entire Holiday House is very well provided and features a high quality equipment. 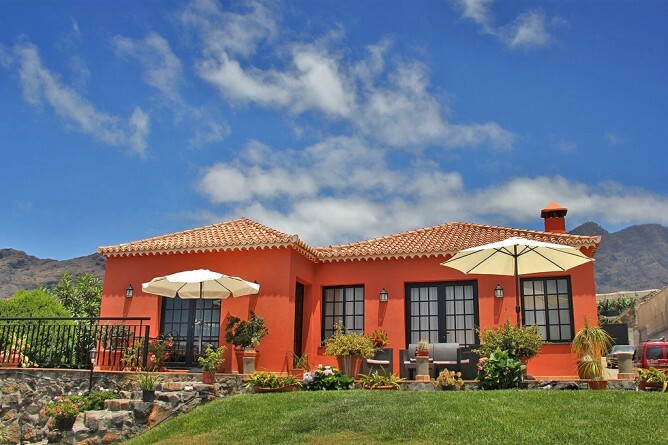 The Holiday Villa is situated on the outskirts of Los Llanos in the district Los Barros, above the centre of Los Llanos. You can conveniently walk from the Holiday Home to the centre, go shopping, eat out or enjoy a Cortado (coffee) on the Plaza. 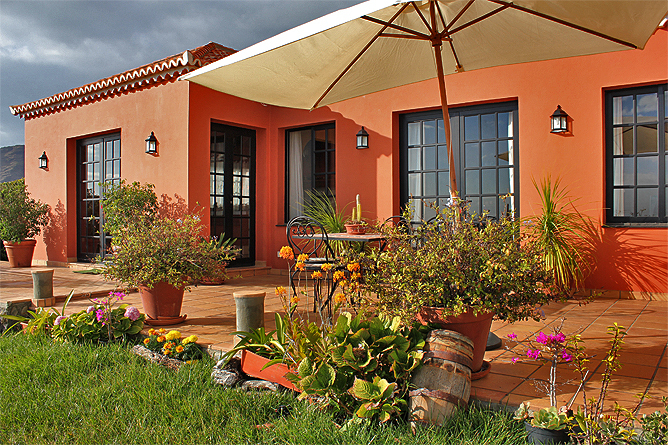 Los Llanos is the secret capital of the island and invites you to stroll along the pedestrian zone and the Plaza. The market hall is opened daily and offers fresh fish, fruits, vegetable and other local products. 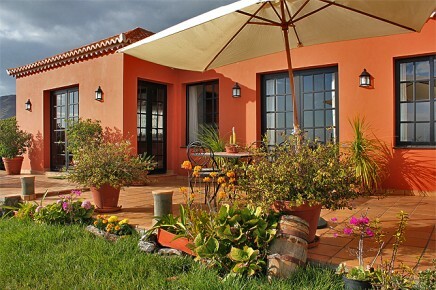 The Holiday Villa is an excellent starting point for hiking tours. 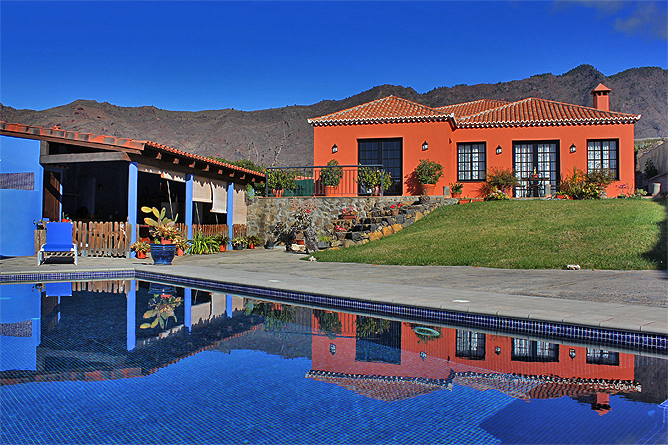 La Caldera is only a 10 minutes walking distance, from there you can hike towards Brecitos or the Barranco de Angustias. La Cumbrecita is only 15-20 Min. 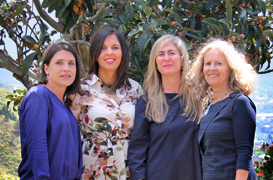 from Villa Greca.